Adventures in the Banana – These aren't gray hairs, these are highlights! I’ve never been a car or driving person. In fact, I’ve said for years that if I was ever required to identify a getaway car, my reply would be along the lines of ‘it was [insert color here]’ because make and model would not register with me. And while I can drive, I’ve rarely found it enjoyable – I’m more comfortable walking and using public transportation to get from one place to another. But the Banana changed all that. Driving that car gave me more pleasure than I would have thought possible. 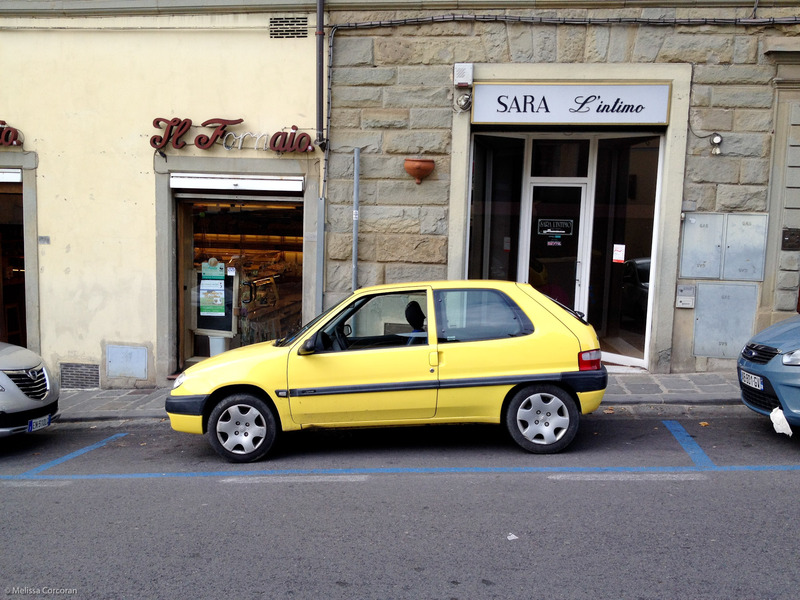 The Banana is a yellow Citroen with standard transmission and no power steering and thanks to the good offices of two people I’ll call Ron and Martha, because those are their names, it was available to me for the several weeks I was in the Casentino Valley. On my initial forays with the car, my constant thought was, ‘this is a case of fools rushing in where angels fear to tread.’ On our first day trip – to San Marino – I flinched when other drivers came towards me – either when passing other cars or edging onto my side of the road on a curve. Add to that the challenge of steering and shifting on the winding roads (directions like ‘go straight here’ have no meaning in that area) and it’s a wonder I saw any of the beautiful scenery. But as time went on, I came to enjoy driving in the Casentino, and specifically, driving the Banana. It was fun going up and down the hills and around the bends and shifting every 25 feet (slight exaggeration, but sometimes, it felt that way). I stopped flinching every time another car came towards me – I figured the other drivers knew what they were doing. I also started driving more like an Italian – which started in self-defense, but soon became enjoyable and my preferred modus operandi. I even became reasonably adept at parallel parking, something that in the past I found a challenge even with power steering and automatic transmission. The car took me/us not just to Stia and Bibbiena for groceries and Pratovecchio for vet visits, but further afield to places I wouldn’t have seen without it, like Castello di Romena, Poppi, Camoldoli, Anghiari, LaVerna, Cortona, and Montemignaio. I loved the ‘open road’ feeling and exploring interesting and beautiful places on my own or with my friend. Along the way, there were minor triumphs in driving, like the day I went to Poppi. I didn’t see the turn to the parking lot outside the old city and wound up driving its narrow, hilly streets and what’s more, actually parking there. On another trip, I found myself passing two cars at a time, something that would have scared the heck out of me even a month previously. Who would have thought that driving a Banana could be such a joyous experience?! An achievement in parallel parking! Standard shift, no power steering, and on a slope! Haha, welcome to the world of no power steering! Awesome!!! What great adventures! Going to rename you the banana daredevil! picture of the glorious Banana ?? At the end of the post in my shiningly wonderful parking job!